Well, here it goes. The beginning of my new car blog. The beginning in a adventure to document my newly found passion for automotive repair and rebuilding. The aims of this blog are to document and share my own projects, experience, thoughts and insights to the automotive world at large. I’m about to turn 38 years old and have learned a lot over the last ten years trying to save money tackling my own automotive repairs and diagnostics. There have been so many great people providing excellent content via you tube and other sites that I though I might as well contribute back to the knowledge pool. 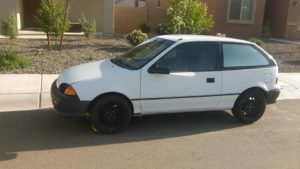 My first attempt at rebuilding a engine was a 1993 Geo metro. I purchased it for $200 from a local Craig’s list ad. It was not running and covered in dirt and cobwebs. There was a large black widows nest with sacks of babies too. I had no clue what was wrong with it, what I got myself into or If id be able to fix it. My brother was nice enough to help me tow it home with my 2007 dodge grand caravan. We strapped a cheap tow strap to it and towed the Geo metro 100 miles to my home. Looking back it was probably not the safest way to tow a car and now I would do it much different. After getting the 1993 Geo metro safely home I took some time to clean it up a bit and started diagnosing why it would not start. First thing was to purchase a new battery. 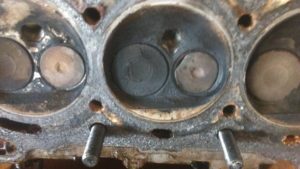 With the new battery installed The electrical systems powered right up and the small 3 cylinder engine would crank no problem, yet it would not start After searching many forums I found a basic list of things to look for. The first thing was fuel. Check to see if the engine is getting fuel. So I found the location of the fuel line in the engine bay and disconnected it to see if there was any fuel. I honestly had no clue what the f I was doing but I guess everyone has to start somewhere. I placed the line in a empty milk jug and had my son turning the key so I could inspect and see if any fuel came out. No fuel. So next I decided that the fuel pump was probably the culprit so I researched how to change the Geo metro’s fuel pump. In order to locate the fuel pump in the Geo metro you need to drop the gas tank. This was a first for me. Over all it proved to be a moderately simple task. With the Geo metro fuel tank out I removed the fuel pump and discovered that the tank was full of rust and the fuel pump was definitely inoperable. I didn’t even need to test it. So I ordered a new fuel pump and started to do some research on how to clean a rusty Geo metro gas tank. After more research I came to the idea of filling the tank with vinegar and bb’s from a bb gun. This actually worked quite well after letting the vinegar soak in the tank for a bit. The difficult part was removing all the bb’s. None the less it was much better and I installed the new pump, replaced the fuel filter, and put bolted the tank back onto the body of the car. Turns out this was the problem and the car started right up after a few cranks. To do this test, you will need an assistant to help you. It is best to perform this test with the engine warm, but if it will not start, then you have no choice but to test it cold. First off, you need to remove the coil wire and then remove all the spark plugs. Be sure to mark your wires so you do not get confused. Find the appropriate adapter in your compression test kit to match the spark plug thread and insert it into the #1 cylinder. You just thread it right into the cylinder by hand until it’s snug. After you have the tester inserted, make sure your car is out of gear or in Park and the parking brake is set. Have your assistant hold the gas pedal all the way to the floor (WOT – Wide Open Throttle) and begin cranking the engine over for a count of 5 to 7 seconds. Record your readings from the gauge and repeat this on all cylinders. Now add one teaspoon of engine oil into the cylinders and repeat the compression test one cylinder at a time. This will give you the “wet” readings and determine if you have worn rings. The compression readings should be no less than 156 PSI on all cylinders and they should not vary much between the other cylinders. A really healthy engine will have around 200 PSI of compression. Please note that these engines will run with lower compression numbers, but will not run correctly or get the expected fuel mileage. That was the problem. Bad compression. I was a little bummed because I really wanted to drive the car and use it for work delivering pizza. So back to the drawing board. After a bit of research and contemplating what the best option would be I decided on a complete engine rebuild. This would be my first engine rebuild. I had never done anything like this in my life. I spent a lot of time researching the parts I would need and placed the orders. I purchased most of the parts on eBay. Then I got started carefully dissembling the small 3 cylinder engine. I labeled all the wires and took quite a few pictures. I put organized all the parts so I would remember the order in which I removed them. In hind sight after dealing with Some BMW’s I realize how easy to understand the wire harness in the Geo metro is and my worries were over warranted. I had a lot of fun though and learned quite a bit about how a car is assembled. I learned every inch of that engine bay. Between work and the kids the rebuild took me about 1 month I think. Again this was about 2 years ago so I can’t quite remember. I ended up replace the piston rings, honing the cylinders, had the cylinder head resurfaced, learned how to lap new valves into the head, replace the valve seals, install the crank shaft and check for clearances. I Installed a new oil pump, water pump and numerous other new gaskets too. It was like a new engine. I replace a few other things that I probably didn’t need to also like the starter and axles but It was worth it. The one thing that I messed up and forgot to replace was the small pilot bearing that the clutch uses. I guess I missed it during reassembly. When I was done It started right up and was running like a champ. I felt so accomplished and in awe that I could learn how to do all this work with google and you tube. I ended up driving that little car over 100k miles before I sold it. I was delivering pizzas in it so I was driving over 100 miles every day. Never had any issues besides a squealing pilot bearing and some basic maintenance. It was a really fun little car. I wish I would not have sold it but it was a bit dangerous driving on the highway or with my kids in it. It was like a tiny tin can. I had a couple incidents that were to close for comfort. When I sold it the 1993 Geo metro had over 400k miles on it. I still miss that car. A damaged valve in the cylinder head of the 1993 Geo metro. 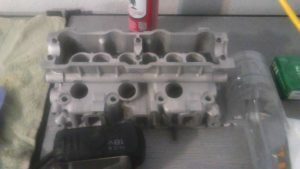 1993 Geo metro cylinder head after cleaning. 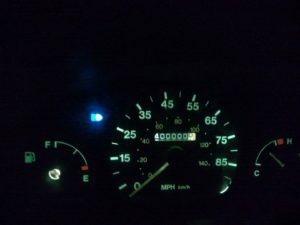 1993 Geo metro engine rebuild crossing 400,000 miles. 100k on my first engine rebuild. I’m so thankful to the many people who put their knowledge out there for people to absorb and learn from. They have helped me save so much money over the years and now I hope to give back some and hopefully help or inspire others to learn and try their own automotive work. I’m still a novice and enjoy the process of learning new things. The Geo metro was a launching pad for wanting to learn more about engines and faster cars. 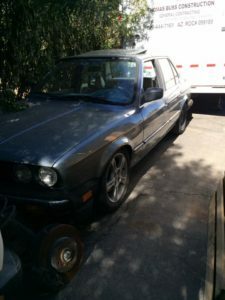 My latest project is a 1985 BMW 325e I purchased for $1000. It was also not running and the suspension had been cut so it was in bad shape. I replaced the fuel pump, and crank sensor. Luckily I managed to get it fired up and driving. Subsequently I purchased a 1989 BMW 535I E34 as a parts car. 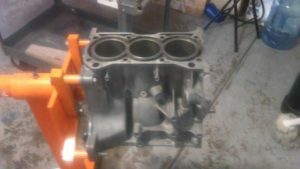 The plan is to swap the slower m20b27 engine in the 1985 BMW 325e e30 for the more powerful m30b35 engine in the e34 535i. Im still debating on what to do and how to do it. Still doing research but I will be posting more about this project, other learning experiences I’ve been through soon. 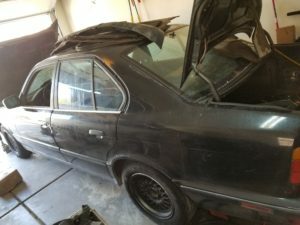 1989 BMW 535i e34 Parts car. Purchased this car for the m30b35 engine.